'Case Pyhäjoki – Artistic reflections on nuclear influence' was a trans-disciplinary expedition and production workshop in Pyhäjoki, Northern Finland from 1.-11.8.2013. 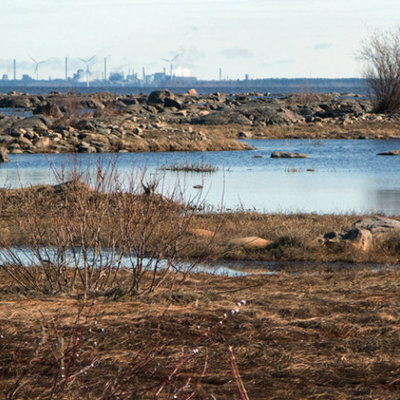 The sixth nuclear power plant (NPP) of the country is planned to be built in Pyhäjoki Hanhikivi cape. 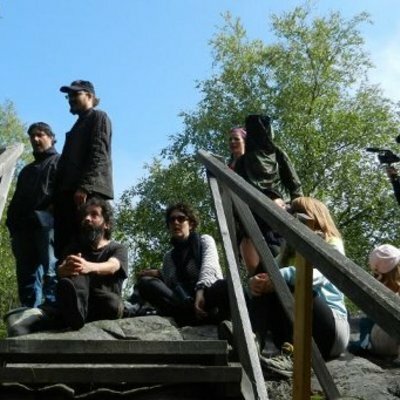 Participants of Case Pyhäjoki were for example artists, researchers and activists. The programme consisted of lectures, meeting local people and expeditions of different kinds to get to know the area; nuclear power as a phenomenon, and what the power plant means to people. It reaches from the local to national and global. What are artists' role related to the changes in the area and wider? How can we develop methods of creative work in a complex and contested place of social tragedy and distress? How can we communicate this through to wider networks? The following text below is a report by Case Pyhäjoki initiator, artistic director and executive producer Mari Keski-Korsu. Case Pyhäjoki was organised as a collaborative work group in between herself, artist-organiser and researcher Andrew Gryf Paterson (Pixelache) and musician and artist Antye Greie-Ripatti (Hai Art). Other supporting partners included Finnish Bioart Society and Pro Hanhikivi. Case Pyhäjoki was funded by Kone Foundation and Arts Promotion Centre of Finland (Taike). The participants created different types of engagements, prototype events and experiments, reaching from a large 'thank you' sign for those who refuse to sell their land to the nuclear power company, to the design of a 'power sports day'; including a local fairytale, a mural painting with local youth, a special karaoke playlist, a DIY geiger counter building workshop, and more. The more includes new and deepened friendships, collaborations and memories of good times and meetings with local people. The participants of Case Pyhäjoki were: Ryoko Akama (JP/UK), Erich Berger (AT/FI), Brett Bloom (US/DK), Bonnie Fortune (US/DK), Carmen Fetz (AT), Antye Greie-Ripatti (FI/DE), Martin Howse (UK/DE), Mari Keski-Korsu (FI), Maarit Laihonen (FI), Liisa Louhela (FI), Pik Ki Leung (HK), Mikko Lipiäinen (FI), Shin Mizukoshi (JP), Helene von Oldenburg (DE), Opposite_Solutions (RO), Andrew Gryf Paterson (SCO/FI), Leena Pukki (FI), and Heidi Räsänen (FI). For the past one and half months following the Case Pyhäjoki residency, the participants have been writing their reflections and documentations on this website. It has been a fruitful time looking back and also to the future. But now, it is time to finish with the documentation and leave this website as it is – while looking forward to when it can be activated again with new art, activism, science, nuclear and energy -related projects that have seeded off from the initial residency period in August 2013. Pyhäjoki has been a small, peaceful agricultural municipality until some years ago, when the nuclear power plant project started. Now, the community is divided strongly to those who are against and those for the NPP. This has already created a social tragedy in the area which will not go away overnight, whether the NPP is built or not. As a place, Pyhäjoki is now an especially charged site: on the edge of possible massive change. Such a unique condition doesn't appear to exist anywhere else in Finland, and there are not many like it nearby internationally. There are few NPPs planned to be built currently in Europe, and the Bothnian bay in which the plans are situated, is part of an approximately 1200 km diameter wide Nuclear free-zone circle in Northern Europe. The energy consortiums of the world are paying attention to what will happen in Pyhäjoki. Considering this context, it is very different to discuss about energy production, consumption, climate change or nuclear power in Pyhäjoki, rather than doing so somewhere else. All these issues become very concrete when you are physically in the place where the change is actually going to happen. The beauty of art is that there is seldomly a clear yes or no, as with in activism, where many times there is. Nevertheless, it is fair to say that there were as many perspectives presented as people in Case Pyhäjoki, but a mutual concern by everyone was the situation both social and environmental in Pyhäjoki, aswell as the wider global context. The overall aim was not to go and demonstrate against the NPP - although that was done, too at some point - but to study, explore, and find different perspectives of the issue and the situation. To recapitulate, firstly it was important to be in the place, in Pyhäjoki. Secondly, it was important to state that we know what is happening in Pyhäjoki. Case Pyhäjoki was not invited to Pyhäjoki by the local community, any art organisation, NGO or the municipality – and the cause of disagreement in the community is crystal clear. It was very obvious from the beginning we were outsiders, but people also quite fast got used to us, and some local collaborations emerged. There was an aim to facilitate encounters with people from both pro- and anti-nuclear sides in the community, but communication with the pro-nuclear portion was rather quiet from their side. There are also few artists who would support nuclear power. Still, it is important to acknowledge that all the people who came to Pyhäjoki, were working - as is often described in art-discourse - from a strong 'site-specific' perspective. That is, plain-speaking, not coming with 'ready-to-go' ideas that would then have been realised without adjustment on the ground. This tells much about the respect that was very present in the group: respect towards each other, and towards local people, regardless of their opinion on the nuclear power project. It is not simple to create healthy confusion and freshness in Pyhäjoki community or Finnish society. The public discussion is so polarised to yes or no (as with other matters, not just nuclear power) that anything disturbing or shaking this setting is significant. I believe we were able to to share information about the Pyhäjoki situation, and contextualise it within a larger global scale. Most people don't know about Pyhäjoki, not even in Finland. As a small example and detail, we know that the Fennovoima main office in Helsinki contacted the Pyhäjoki mayor to ask what are these Case Pyhäjoki people doing. Even though art or activism is sometimes considered something not to be taken seriously – it is good to hear that people are asking questions. There was a discussion between Case Pyhäjoki participants, considering their role, and what art+activism might mean especially in this context. All the participants agreed that the time we spent in Pyhäjoki was not long enough to work in depth, but it was relevant for them to do preliminary research, and practice works, aswell as to create something in the future. As Erich Berger said, it is important to consider having indirect connections, because otherwise you are likely to impose something upon people, and they don't understand why you do it. To elaborate Erich's point, the difference inbetween direct and indirect connections was much thought of there as the difference between the time for research, and the time for action. For example, the indirect connection could be the work done by Andrew Paterson and Mikko Lipiäinen in Pyhäjoki library, talking with the librarians about organising a wikisprint, and proposing the compiling together of a more comprehensive and balanced book collection of nuclear-related books. Or, to take a more mundane example, everyone was going to the local grocery store, and exchanging a few words with people; and many contributed as (inter)national visitors to the local disco and karaoke as other locals do. Furthermore, Leena Pukki's 'Speak up' mural art workshop aswell as Erich Berger's and Martin Howse's 'Geiger counter building' -workshop could be described as an indirect connection that was made with local youth and adults. It means that you're not straight-forwardly addressing the nuclear issue, but you are present; and importantly learn more about everyday life in the community and how it might change when the NPP may exist. Hence, the indirect connection can be part of an investigative and research phase, but it can also contribute to the overall empowerment of the community. The direct connections or actions that happened, on the other hand, were very much addressing the issue of nuclear power. The most clear example is the Thank You (Kiitos) sign for the landowners who refuse to sell their land to nuclear power, that was made by Bonnie Fortune, Brett Bloom and Daniela Palimariu, and contributed to the activist sign deployment in Parhalahti, near Pyhäjoki, and at Hanhikivi cape itself, the site of the planned nuclear power plant. 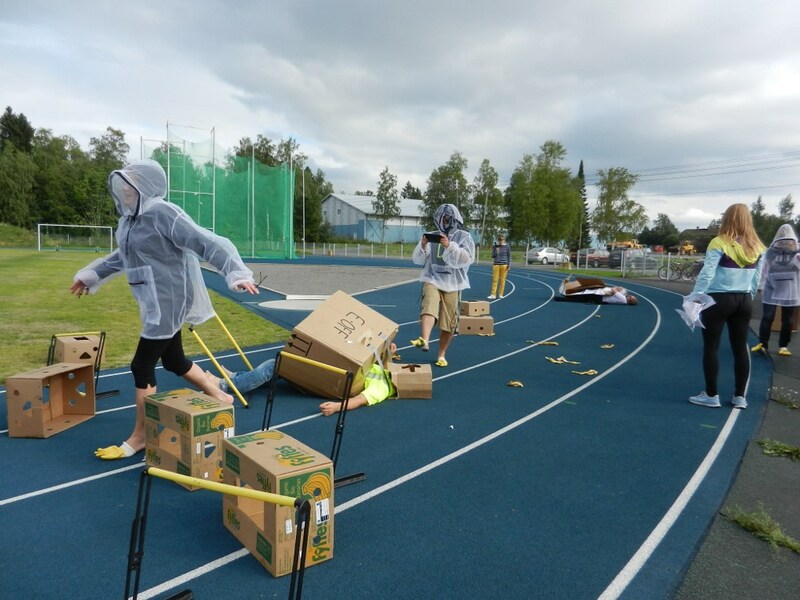 Likewise, the Power sports day event initiated by Carmen Fetz, narrated in a performance the history of the local nuclear politics in Pyhäjoki as a race. Antye Greie-Ripatti and Ryoko Akama were quite straightforward with their message, even though it combined other extraordinary aspects too, when they made their 'Sonic Boat Journey' from Hailuoto to Pyhäjoki across the water between the two locations. It is good to realise that activists like Pro Hanhikivi know what they are doing, and do it very well, including preparing legal complaints and reports. Also organisations like Greenpeace do their job well implementing the emotional, visual language of the advertising world (yes, the advertising world implements the visual language of activism, too). But there is still a place for art and creative activism, especially in Finland where as mentioned above, the discourse can often and easily become black and white, yes and no. The boundaries don't need to exist. As John Jordan shared in his lecture in Pyhäjoki, suggesting the value of these contributions to a contested topic: art can disappear, and then we can talk about the things we really want to talk about. It's fascinating to say that artists can make art disappear. They can go to places, meet and talk with people you wouldn't necessarily meet in any other profession. It gives one a perfect disguise to be creatively curious. Mikko Lipiäinen said that while activists focus on pragmatics to reach a certain goal, the artists are not obliged to do that. This is why they can be open for different directions. But yet again, Leena Pukki has noticed from her experience that when being an activist, you don't need to analyse what you do as you often need to do with art projects, which sometimes can can go on and on. With these kinds of hybrid identities, such creative activist (art+activism or artivistic) people are always crossing in between modes of action and process. It has been amazing this past one and half months to see how this Case Pyhäjoki website (and its social media reflection) has been taken care of, and how much energy the participants have chosen to put into it. Many times when these kind of work periods are over, people go on with their other projects and life, not necessarily ever looking back. This is probably one of the biggest challenges in creative activism, community or participatory art processes. Creating frameworks for continuity for the work, which in Pyhäjoki is not the easiest of tasks. It is beautiful to see how committed we are, and have been. There are no words to describe the gratefulness that I feel at the moment. There is a big Hanhikivi stone in my heart but it is not heavy. The only thing I can say is thank you. As Martin Howse wisely pointed out: let's go with joy and love. * On the Media -page there is the latest press release of Case Pyhäjoki in English, German and Russian. Feel free to send this release to your networks. * We will have a discussion event at Arkadia international bookshop in Helsinki on 5.12.2013 at 18.00 in Finnish & English, welcome to join!